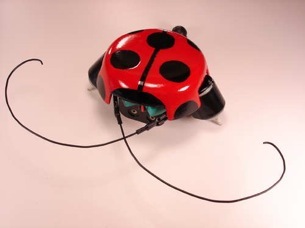 A funny one is the Beetle Bot: not too hard to make and all you need in terms of electronics is a pair of simple switches and a battery-holder. When it touches something, the circuit on that side is reversed and the motor runs backwards, making it steer away from the obstruction. Very clever and elegant design. I made mine without the shell, because I think you should see the insides. Try it out and build one yourself.